Doduo in game: 8,442 Who? Important notice! Pokemon Doduo is a fictional character of humans. 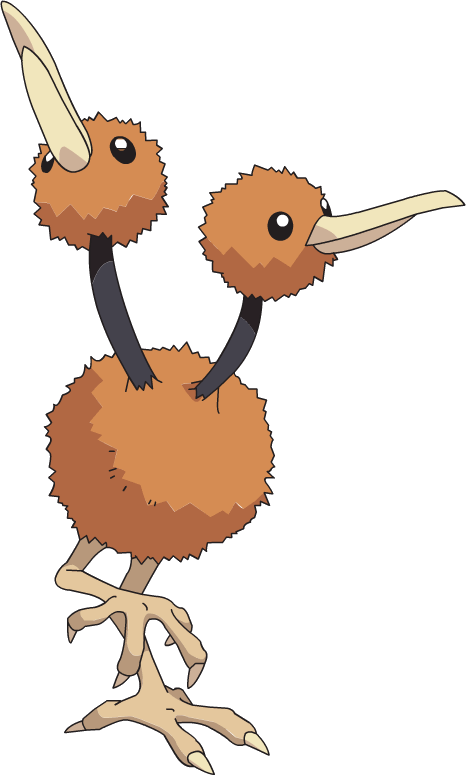 Doduo (Japanese: ドードー Dodo) is a dual-type Normal/Flying Pokémon introduced in Generation I. It evolves into Dodrio starting at level 31. 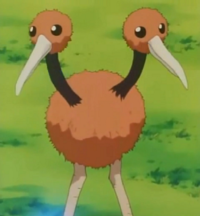 Doduo is a two-headed, bipedal avian Pokémon. Each head has a long sharp beak and two beady black eyes with no discernible sclerae. It has a soft but bristly, down-like covering of brown feathers on its body and both heads. The males of the species have black flexible necks, whereas females have brown necks; both genders have brown coloring on their legs. It has two feet, each with four digits ending in a sharp claw. Even when sleeping or nourishing itself with food and water, one head is always awake and alert and keeps a keen eye out for enemies. Both heads have an identical brain. However, it is believed that on occasion they may possess different sets of brains. It is also theorized that the two heads communicate with some form of telepathy to be coordinated with one another. Due to its almost non-existent wings, it cannot fly very well but has developed its legs to be a very powerful runner. Reaching speeds of 60 mph (96.5 km/h), it energetically strides across the plains leaving large, 4" (10.6 cm) deep foot prints behind it. Doduo lives in wide open plains, grasslands, and savannahs. Doduo's first appearance was a cameo at Professor Oak's laboratory in Showdown at the Po-ké Corral, belonging to Gary Oak. It eventually evolved into a Dodrio. In Bad to the Bone, Otoshi tried to fight off Team Rocket with a Doduo, but he was failing miserably until his Marowak decided to return. A Doduo appeared in Lights, Camera, Quack-tion, as part of the cast for the movie "Pokémon in Love". 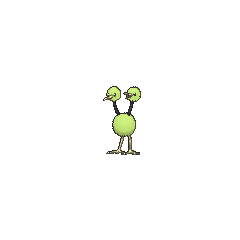 Doduo also appeared in The Power of One. A Doduo was one of the Pokémon seen at the Pokémon Swap Meet in Tricks of the Trade. A Doduo was one of the Pokémon seen at Wings Alexander's barn in Throwing in the Noctowl. Multiple Doduo appeared in the opening of Destiny Deoxys. A Doduo appeared in All Dressed Up With Somewhere To Go! participating in the Pokémon Dress-Up Contest. A Doduo appeared in Pokémon Ranger and the Kidnapped Riolu! Part One. A Doduo made a brief appearance under the ownership of a Trainer in the Lily of the Valley Conference in An Old Family Blend!. A Doduo appeared in the opening scenes of Zoroark: Master of Illusions. A Doduo appeared in Kalos, Where Dreams and Adventures Begin! and it appeared again during a flashback in Till We Compete Again!. A Doduo appeared in Clemont's Got a Secret!. 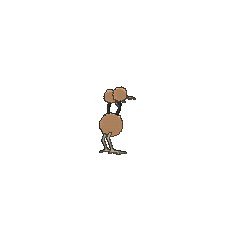 A Doduo appeared in Awakening the Sleeping Giant. A Doduo appeared in SS028. 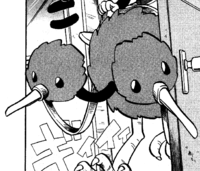 A Doduo appeared in Mega Evolution Special II. Two Doduo appeared in A Race for Home!. Mutltiple Doduo appeared in Mega Evolution Special III, including some of them belonging to the Trainers. A Trainer's Doduo appeared in Forming a More Perfect Union!. EP065 Doduo Ash's Pokédex Doduo, the Twin Bird Pokémon. It runs faster than it can fly. EP073 Doduo Ash's Pokédex Doduo, a Twin Bird Pokémon. Once its heads begin to fight each other, Doduo becomes incapacitated. In Sigh for Psyduck, Mr. Fuji is revealed to have had a Doduo that passed away due to old age, but could not be properly buried due to the unidentified ghost that haunted the Pokémon Tower. After Red and Blue succeed in defeating it and Koga, it was finally able to rest in peace. A Doduo appeared as a silhouette when Green explains about Mew in The Jynx Jinx. Prior to her appearance in Do do that Doduo, Yellow was given a Doduo that eventually evolved in The Might of... Metapod?!. The person who gave her Doduo is revealed in Tyranitar War to be her uncle, Fisherman Wilton. Blue has two Doduo which he used as a method of flight transportation to lift up him and his Blastoise in Getting The Flying Machine!!. 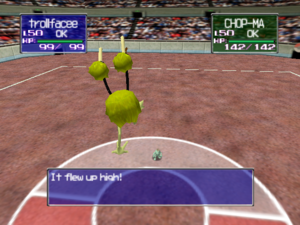 A Doduo is seen with Green during the baseball match that took place in Fierce Competition at the Pokémon Baseball Tournament!. Giovanni has a Doduo as seen in Pokémon Hair Salon Opens!!. Shigeru has a Doduo which he caught it in the Safari Zone. One Doduo figure has been released. A bird that makes up for its poor flying with its fast foot speed. Leaves giant footprints. Its short wings make flying difficult. Instead, this Pokémon runs at high speed on developed legs. A Pokémon with two heads. More skilled at running than flying, it is capable of racing at speeds over 60 mph. By alternately raising and lowering its two heads, it balances itself to be more stable while running. It races through grassy plains with powerful strides, leaving footprints up to four inches deep. It lives on a grassy plain where it can see a long way. If it sees an enemy, it runs away at 60 mph. Doduo's two heads contain completely identical brains. A scientific study reported that on rare occasions, there will be examples of this Pokémon possessing different sets of brains. Even while eating or sleeping, one of the heads remains always vigilant for any sign of danger. When threatened, it flees at over 60 miles per hour. A two-headed Pokémon that was discovered as a sudden mutation. It runs at a pace of over 60 miles per hour. The brains in its two heads appear to communicate emotions to each other with telepathic power. This Pokémon's Special base stat in Generation I was 35. Moves marked with a superscript game abbreviation can only be bred onto Doduo in that game. 51%-100% HP Left or right, I can see both ways! 26%-50% HP I think maybe my HP's about half. Level up Yow! I leveled up! Doduo can run at an incredible speed on its sturdy and stable legs. It attacks by pecking with its sharp beaks and charging. For other sprites and images, please see Doduo images on the Bulbagarden Archives. In the Pokémon Red and Blue beta, Doduo was originally known as "Dodo", its Japanese name. Before Generation IV, the necks of normal Doduo were black (which became the male neck color), while its evolution's necks were beige (which became the female neck color). Despite its non-existent wings, Doduo and its evolution are capable of learning Steel Wing and Fly. Despite its name, it seems like it has more in common with ostriches than dodos. It also seems to show some similarity to the moa, an extinct flightless bird indigenous to New Zealand, and the emu, another flightless bird. It also resembles the kiwi in some ways as well. 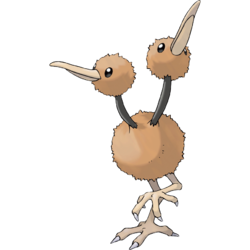 Doduo is a combination of dodo (an extinct, flightless bird) and duo (a pair). Cantonese Chinese 多多 Dōdō Transliteration of its Japanese name. Literally "Many"